In the morning, we visited Mutrah’s Bait Al Baranda - a traditional 19th Century house that has been converted into a small museum presenting the sea-faring history, geology, musical heritage and contemporary arts of Oman. Breathtaking Al Bustan. Finally one of the moments I’d been waiting for – our trip to Al Bustan hotel! We had contemplated it from afar during our boat trip but now the moment had come to enter this luxurious former palace that has won the award for the best hotel in the Middle East several times! Nestling between a beautiful backdrop of mountains and the sea, this is definitely the most amazing hotel I’ve ever seen. 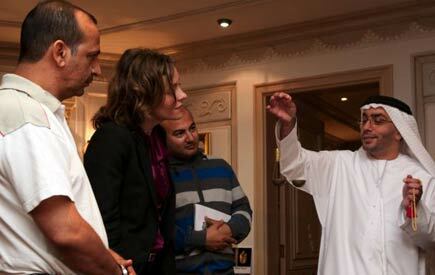 We toured the hotel accompanied by the Assistant Director of Sales Sameer Al-Harthy. He showed us around the restaurants and luxurious suites furnished with wooden mother-of-pearl engraved beds, and butler-serviced rooms! 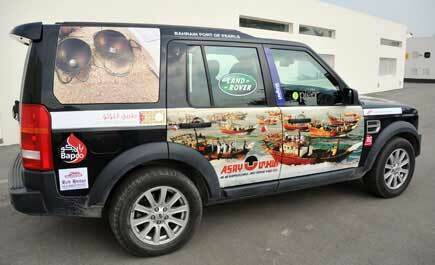 Caves, blind fish and Omani Halwa! Now imagine this, on one fine sunny Omani morning you take your goats out to pasture and you find a 5km underground cave that ends up becoming one of Oman’s greatest tourism sites. That’s how the more than 2 million year-old Al Hoota Cave was discovered. 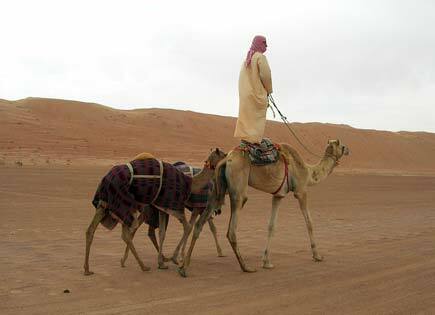 I just hope the goat herder got some recognition! 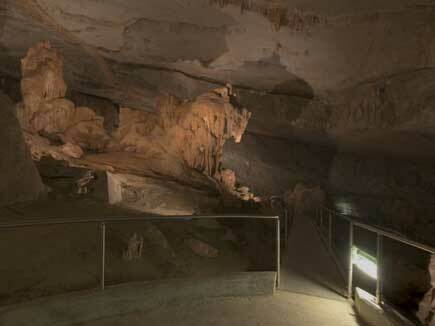 Al Hoota Cave is in a town called Al Hamra, 221 Km South West of Muscat. We arrived before lunch, after checking out of our Muscat hotel. Once again we were joined by our Omani friends Mohamed and Faiz who make our trip feel truly authentic. I absolutely love their ‘kummah’ (traditional Omani caps) and bombarding them with questions. I must start by saying just how great it is to be back in the region and on the road again with my fantastic Friendship Arabia team! The past few days have been a bit hard for me as I learnt that my granny passed away on the day I set out for Oman. Miles away from Spain, and missing my beloved granny who lived 90 beautiful years, I was very lucky to be surrounded by such a friendly team! Happy New Year! Today is Islamic New Year, Happy New Year to all the Muslims around the world on behalf of the Friendship Arabia team! Bahrain’s triathlon team in Oman. 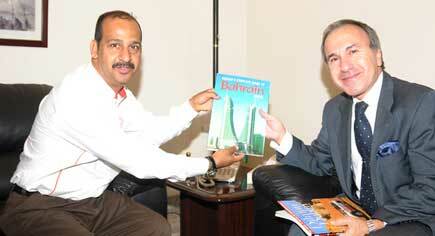 It’s good to see we’re not the only people promoting Bahrain in Oman. By chance Ammar bumped into Sager bin Ahmed and the rest of Bahrain’s Cycling Association in the hotel lobby. The team had just completed a triathlon in Muscat and are vying to build up Bahrain’s triathlon team for the Olympics. We wish you guys all the best! A diplomatic coincidence. During our last trip in Jordan His Excellency Faoud Salman Al Moawda was serving as Bahrain’s Charge D'Affaires to the country. A year later, we meet again in Muscat where H.E., now Ambassador to Oman, hosted us for a traditional Bahraini lunch at his residence. It’s a 9am start followed by a fantastic buffet breakfast for the Friendship Arabia team. Next, time for a photo shoot with Mr Francois Galois, the General Manager of our new hotel - The Park Inn Hotel (Al Khuwayr – Muscat). This is in fact the first Park Inn in the GCC and opened in March this year. But, Mr Galoisy who hails from Bordeaux is no stranger to the region and has spent around 7 years in the Middle East. Well-travelled and versed in regional tourism efforts, he spoke very highly of our project. 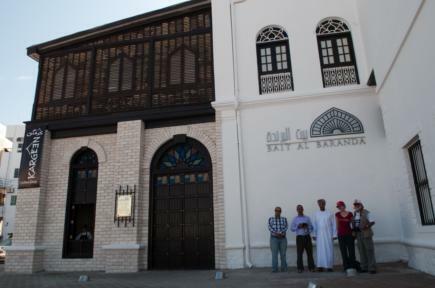 Next, we hit the road in search of one of Muscat’s most popular museums. En route, while searching for a petrol station, we discover that the word shisha also means petrol station in Arabic! First destination of the day, Muscat’s Natural History Museum, the place to examine Oman’s fauna and flora from time immemorial. 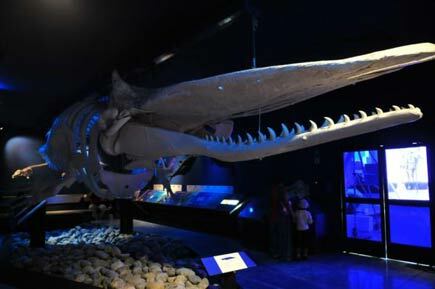 The highlight of the Natural History Museum is the skeleton of a sperm whale, which was washed up the shores of Oman in the 1980s. Adjacent to the Natural History Museum is the Faisal Museum which houses traditional Omani weaponry and of course the famous Khanjars. We left Bahrain early in the morning of the 15th and it took us about 9 hours to get to Abu Dhabi where we picked up fellow team member Maria Ramos. From there, we headed straight to Mr. Khalid Al-Sayegh, the famous pearl merchant (more details about him in a future report from Maria) at his private pearl museum. Abu Dhabi TV crew were waiting for us to record the first destination of the team and talk about Mr. Al-Sayegh's role as a prominent pearl merchant. Mr. Al-Sayegh gave us an interesting tour of his museum, talking about the history of the pearl business in the world and the Arabian Gulf, and also his family's involvement in it. He also showed us some rare pearls and the tools used in the business. From the Gulf Daily News » Bahraini adventurer Ali Mushaima and his friendship team will promote Bahrain's pearling industry during a road trip to Oman that begins today. They will promote tourism and heritage in Bahrain, including a United Nations Educational, Scientific and Cultural Organisation (Unesco) nomination for pearling that will be submitted by the Culture and National Heritage Sector in January. The team includes photographers Ammar Hammad and Haider Akbar, writer Taha Alawi and former Bahrain resident Maria Ramos. 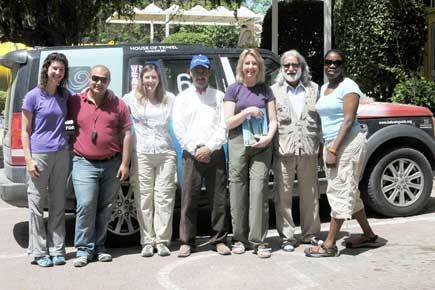 During the eight-day trip from Bahrain to Oman - Manama to Muscat - the group will visit Buraimi, and Niswa. Following the trip Mr Mushaima will publish 101 Things to See and Do in Oman, which has been commissioned by the Omani Tourism Ministry. To mark the trip organisers have launched a website competition which will see the winner receiving a certified pearl ring. The competition is open until January 15. 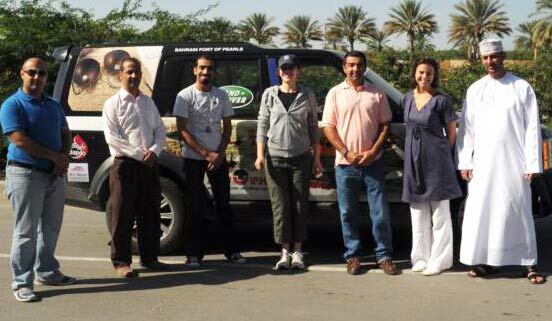 The team will make another trip, from Bahrain to Yemen, entitled Port of Pearls to Port of Coffee, in January. 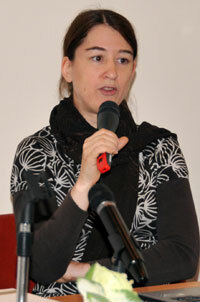 The last trip will be from Bahrain to Greece, or Tylos to Thessaloniki, in May. The tour follows on from Mr Mushaima and his team's Friendship Tour of the Gulf in April and a Friendship Tour around the Middle East and Europe last year. 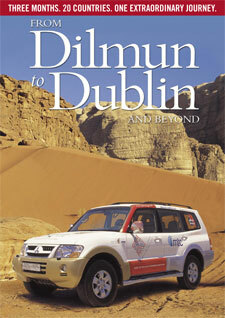 It's a brand new expedition as we head out to Oman tomorrow on the latest installment of our Friendship Arabia tours. On our last trip, we kept Oman as our final destination, and it somehow made sense to continue from where we left off and made it our first point of call this time. There's so much Oman has to offer - from fjords to desert to rugged mountains. If you are interested in fishing, diving, camping or you want to enjoy one of many secluded beaches, Oman is a fantastic choice. What make this country even more endearing is the friendliness of its people. You see the smiles from the time you arrive until the time you leave, and once you leave you know you will be back, because you have made many friends you will want to meet again. Look for more updates on our trip soon. Don't forget to enter our great new contest, to be launched tomorrow. 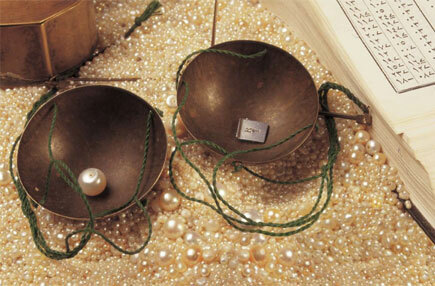 You could win a genuine Bahraini natural pearl! Watch this space for details on a brand new expedition - and a chance for you to win a certified Bahraini natural pearl! (An advance hint: The contest answers can be found on our sister website Bahrainguide.org - feel free to go ahead and do some reading. BAHRAIN's heritage experts and researchers are working on a proposal to put Bahrain's pearl diving tradition on the World Heritage List. Officials from the Culture and National Heritage Sector of the Culture and Information Ministry will submit the proposal to United Nations Educational, Scientific and Cultural Organisation (Unesco) by January 1, 2010. It will take 18 months for the proposal to be reviewed and it will be considered for the World Heritage List by Unesco in 2011. The Unesco nomination covers three oyster beds north of Bahrain, which range between 25km and 70km offshore, the beach area at the southern tip of Muharraq where boats would arrive and leave, and parts of Muharraq, including historical buildings. Part of the nomination includes having a three-kilometre historical trail for visitors that will start at the seaside and continue through the streets of Muharraq, including Al Qaysariya Suq, which the sector plans to preserve and turn into a cultural heritage attraction.